Prepare for a Protein Boost! Tuna: StarKist Ranch Tuna Creations - Ah, the latest flavor to join Charlie's all-star lineup. Perfect straight from the pouch or over a big rice cake. Each pouch has just 80 calories and 2g fat (PointsPlus® value 2*). Supermarket staple! Jerky: Krave Black Cherry Barbecue Pork Jerky - This crazy-good snack comes from a company we love. A 1-oz. serving has just 90 calories and 2.5g fat (PointsPlus® value 2*). And Jack Link's recently launched Sriracha and Burrito flavors of its beef jerky... Mmmmm! Nuts: Wonderful Sweet Chili Pistachios - Mind-blowingly awesome flavor here! Have a 1-oz. serving (about 1/2 cup while the li'l guys are still in the shells) for 160 calories and 14g fat (PointsPlus® value 5*). Cracking open the shells will keep you busy for a while! And when it comes to almonds, try the latest Emerald 100 Calorie Pack: Vanilla Roast Almonds. YUM! Wild Card: Seapoint Farms Dry Roasted Edamame 100 Calorie Snack Packs - Fans of soybeans and crispy snacks should definitely keep an eye out for these! Each pack has 100 calories and 3 - 3.5g fat (PointsPlus® value 2*). Crunchy-good fun! Natural sources of fiber and deliciousness? Yes, please! We just boosted the produce section on our latest supermarket list, and now it's chock full of fresh stuff perfect for snacking. Some of our top picks? Snacky Satisfaction: Jicama Sticks with Salsa - Skip the chips, but keep the crunch! Seriously, if you're not already on the jicama train, hop on. And don't be put off by its appearance (it looks like an oddly shaped potato) -- just slice off the ends, peel off the skin, and cut it into sticks. Pair a cup of jicama with 1/4 cup of salsa for a rockin' snack under 80 calories! Sweet Treat: Mandarin Oranges - These are what we like to call "project foods" -- they require a little work; you can't just bite right in! The need to peel them before chowing down makes you much less likely to mindlessly munch. Shout-out to Wonderful Halos -- they're seedless and only around 50 calories each. Super-Sized Serving: Sugar Snap Peas - These are great for raw snacking, but sometimes we like to lightly steam them. Either way, you get a ginormous serving -- eat 3 1/3 cups for 100 calories! All-Around Favorite: Double Chocolate Chunk Quest Bar - Need an energy boost? A hunger squasher? A decadent dessert swap? This bar takes care of all those things for only 160 calories and 6g fat (PointsPlus® value 5*). Plus, it has 16g fiber and 20g protein! And the very latest Q. bar to hit the snack market? COOKIES & CREAM! Nut-Based Nosh: KIND Dark Chocolate Nuts & Sea Salt - Nut bars are all over the place, but the Nuts & Spices line from KIND has a little extra flavor oomph. This sweet and salty bar is tasty and filling, with a respectable 200 calories and 13g fat (PointsPlus® value 5*). Small-Sized Find: Corazonas Mini Oatmeal Squares - Perfect for true emergency stashing in your purse (or murse). These bite-sized bars are incredibly satisfying, and for just 90 - 100 calories and 2.5 - 3.5g fat each (PointsPlus® value 2 - 3*). Is there a hotter snack category than Greek yogurt right now? We think not. Chobani Bite & Simply 100 - The Greek yogurt mega-star has exploded with new options over the last year. Our favorite lines to emerge? Bite, the small cups with BIGTIME flavor for 100 calories a pop (PointsPlus® value 2 - 3*), and Simply 100, calorie-conscious 5.3-oz. cups of flavored fat-free yogurt (PointsPlus® value 2*). Fage Fruyo - Fage's blended yogurt line is terrific (like all Fage yogurt) and totally deserves a spot in your snack repertoire. Each 6-oz. cup has 140 fat-free calories (PointsPlus® value 4*). Yoplait Greek Blended - Since reformulating its Greek yogurt, Yoplait is officially BACK in the game. The flavor and texture are pretty much perfect now. Each 5.3-oz container has 130 - 150 calories and 0 - 1g fat (PointsPlus® value 3 - 4*). YoCrunch Yopa! Greek - And for those who like crispy add-ins with their yogurt, YoCrunch has that covered. The yogurt + topping combos have 100 - 200 calories and 1 - 8g fat each (PointsPlus® value 3 - 5*). The highest stats are for almond-topped varieties; the lowest are for the smaller four-pack sizes. All excellent! Cheese! Chips! Guilt-free sweets! 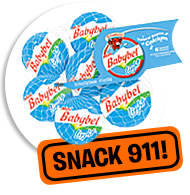 Click here for the TOP ATE types of emergency snacks. And from smashingly good snack bars to pie-flavored chewing gum, this list of emergency snacks has got you covered! Be a pal -- click "Send to a Friend" to share these snack finds! Before you start celebrating National Fettuccine Alfredo Day, February 7th (a.k.a. today), you must check out our classic Fettuccine Hungry Girlfredo recipe. Did we mention it has just 99 calories?